The Infant/Toddler Program gives children 6 weeks to 24 months an opportunity to explore and learn in a loving environment. 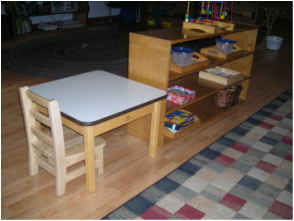 Our Montessori environment is set up to help the child be successful and as independent as possible by providing low shelves, tables, chairs, sinks, and toilets. Teachers will take daily observations and create the classroom based on the children's individual needs. The teachers will also give individual and small group lessons as the children freely move about the classroom. There will be daily opportunities to work in sensorial, practical life, language, math and art areas. The Toddler Program is a program for children between the ages of 24-30 months. This program runs 5 days a week with a choice of a core class, half day, or full day class. The program gives young children an educational challenge while being in a room that is prepared to help make them successful. 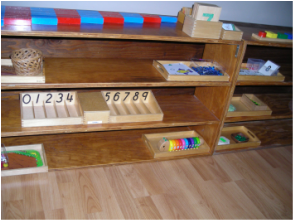 The children will be able to freely explore all areas of the classroom. This includes practical life, language, sensorial, mathematics, geography, science, music and art. 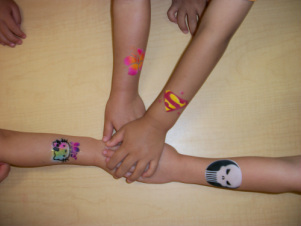 Self care and care of the environment are also emphasized within the Toddler program. 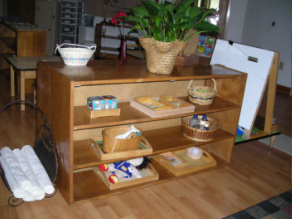 The children have the opportunity to be engaged in the Montessori environment for the entire day and year. This program, will be instructed by a Lead Teacher and allows the children more time and chances to explore materials that interest them in the areas of language, sensorial, music, practical life, art, math, geography, science, and culture. While working at their own pace they will encounter continued instruction, consistency in staff/child interaction, and foster a stronger sense of community. Blending the ages, the Montessori core program operates from September to June, five days a week, three and one half hours a day in the morning. 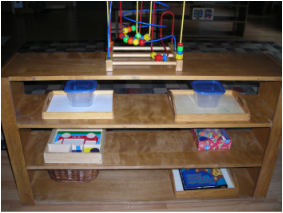 The core program offers the child a step toward independence in the environment specially created for the Montessori child. 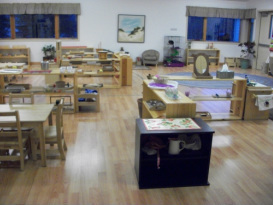 This fun and happy setting offers the child an opportunity to explore language and sensorial skills, music, practical life, art, math materials, geography, science, culture, friendships and sense of community. 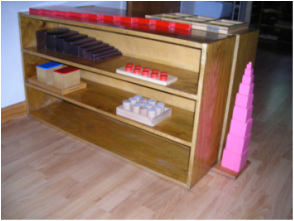 Blending the ages, the Montessori core program operates from September to June, five days a week, three and one half hours a day for the half day program and seven hours a day for the school day program. We offer an all day, school day, half day, and class day Kindergarten. The materials are incorporated into the classroom to accommodate this age group. Many of our students spend 4 years at the school in one classroom, typically with the same teacher, and then go directly into 1st grade. If you would like more information please call our School Director. As parents, you have the choice of the length of day your child attends for their kindergarten experience. At MMS, we offer your kindergartner top quality academic opportunities in language and math, science and geography, and follow the Montessori approach in teaching each student individually to their own unique level. Midland Montessori School offers a Summer Program for current and former MMS students, age six weeks through 8 years old. The children are involved in daily activities that continue their exploration of their environment, engage in extra outdoor summer activities, and includes additional fun classroom themes. The Summer Program is run from mid-June through August. We operate Monday through Friday from 7:30am to 5:30pm. Midland Montessori School offers both Mandarin and Spanish classes for the 3-6 classrooms from October through May during the school year. Parents choose which language class their child will attend. Language teachers visit the classrooms twice per week. During these visits they conduct small group lessons to introduce these different languages to the children. Since the best way to learn a language is to listen to it being spoken, the children learn the target language through extensive exposure. In each lesson, conversation, listening comprehension, basic vocabulary, and cultural perspectives are introduced in an enjoyable way through songs, games, and storytelling. Music instruction is provided biweekly by a private instructor. The music program integrates rhythmic expression and interpretation, group ensemble playing, and gross movement activities set to music. The curriculum encourages singing and listening, in order to build an inner voice and tone/note recognition.